Fingerprint sensors are becoming increasingly common in smartphones, but there are those that want to remind us that they may not be as secure as people may think, showing that a simple inkjet printer may be enough to bypass such protection. It's not the first time that groups have called out the risks of using fingerprints to unlock devices, as this is something that - unlike a password or a PIN - is always the same, and once hackers grab a hold of it, then there's no way to revert it back to being "secure". 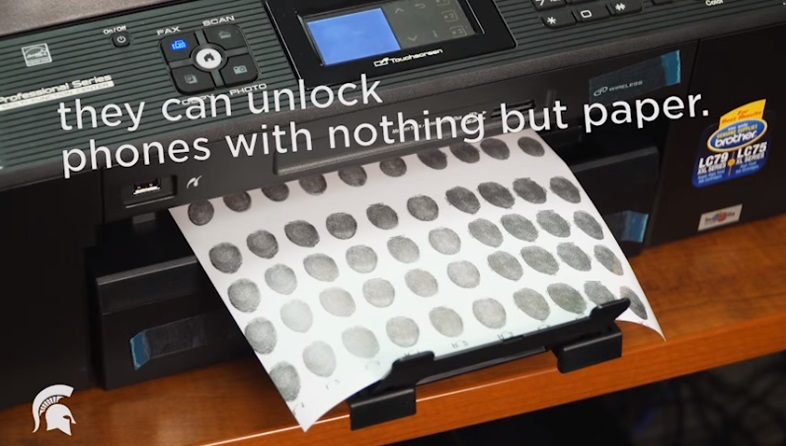 Nos, a team of researchers showed that bypassing a fingerprint sensor is even easier than you might think, using a regular inkjet printer to print fingerprints in conductive ink. Sure, you need to grab a copy of the user's fingerprint, but that's something you'll probably can lift off from the smartphone itself. And, unlike previous methods that required lots of complicated steps to produce a viable print, this is something that can be easily done - all that is left is to press the printed "print" on the sensor, and it's done. This doesn't mean you should stop using a fingerprint protected smartphone, but it should be used as a warning that a fingerprint, by itself, is not a 100% secure method of protection and should instead be considered as a "shortcut" for more common tasks where trading off security for convenience is an acceptable risk.